According to Wikileaks, there's Panic at the Palace. A crinkle in Kate's crinolene? Willie got the wobblies? They're short on the kopi luwak for the after-dinner coffee & choccies. Those of us with a passing interest in coprology will know that kopi luwak gets its rich mellow flavours from its brave journey through the stomach acids and digestive tract of the Asian palm civet. And that's the guts of the problem. Civets don't have opposable thumbs - so they can't build bulldozer busters - so they can't prevent rainforest destruction - so there's less of them - so there's a shortage of civet poop. You get the picture. Less poop = less kopi luwak. At £40 a bean (and in the current economic climate), it's definitely worth trying to fake it. The Palace have certainly tried. All night long, the corgis were turning somersaults and yapping at imaginary caffeine-induced cats, and the queen now has big bags under her eyes (but that's because she's actually quite old). It was also Wikileaks that let the civet cat out of the bag about the secret memo received by all six million Civil Servants earlier this week. For one night only they were all to become Civet Servants. I don't need to spell out what they were asked to do: you can read this for yourself on the Wikileaks website. 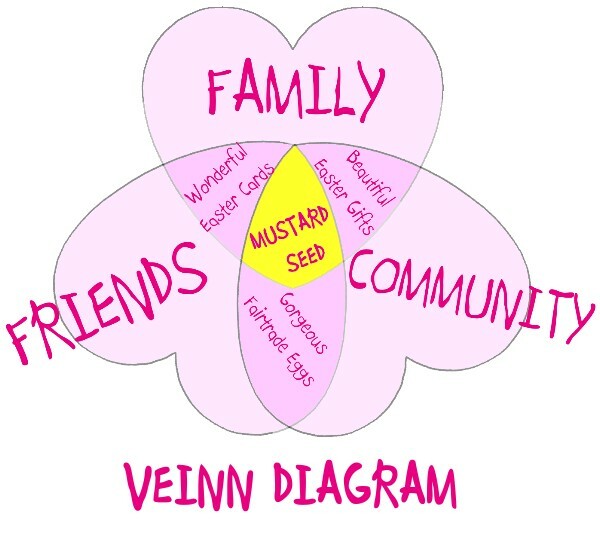 But what has this got to do with the Mustard Seed - you may ask? 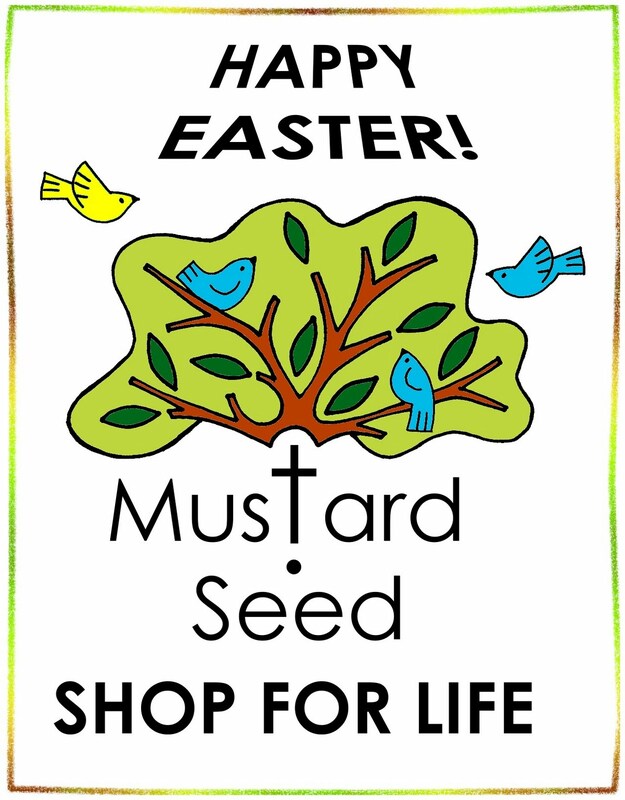 HAPPY EASTER FROM THE MUSTARD SEED! You'll be pleased to hear that the Mustard Seed have engaged the services of an eminent Cardologist to give our hundreds of beautiful Easter Cards a good health check. And he's a Christian - although I haven't previously come across his particular denomination. Barnard? Maybe you've heard of it. He's also quite a hearty fellow - although he does like his big words. Lots of consultants speak in the same vein I suppose. And he wears a cardigan. Here's an example of his cardy-yakking. He could have said quite simply: "From the drawer, move them to the card rack in the Shop. Good air flow is important. Don't block up the corridor. " But this was his version : "Open up the chest, then on three, transplant to my-cardium in the main atrium. 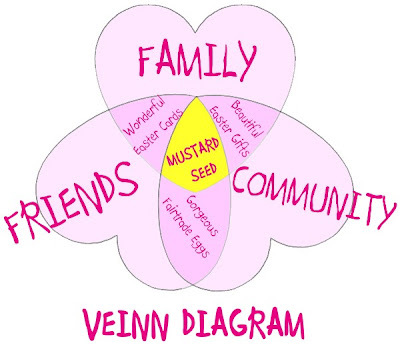 Ventriclation is vital. Avoid blocking arterial passages" . And when poor Rose accidentally overcharged a customer for a beautiful Easter card (she couldn't believe that it was such good value) , our Cardologist was heard to exclaim: "A Cardinal sin - although only Veinial on this occasion! It's a Pull-More-Money-Fibb Rose Is. We need to correct De Fibber Later " . Bizarrely - it actually sounded as if he was talking about pulmonary fibrosis & defibrillators - but I think that's probably just a coincidence. Anyway - our cardiganned cardologist has declared that the wonderful a la card selection of Mustard Seed Easter cards as "simply cardilaginous - cardolic-acid and carduncle-free - and full of healthy cardohydrates" . Yes - excellent news - don't you think? For all our Easter Cards, Easter Gifts, and Easter Eggs. Your Easter Eggs: Scrambled or Poached? According to the eggsperts at wikipedia, The number of folds in a chef's hat supposedly represents the number of ways that s/he knows how to cook a chocolate egg - with the vaunted 100-fold hat reserved only for the heads of the heads of the finest culinary establishments in Lilliput. And did you know the origin of the "egg-timer"? Here's how it started. Sea-farers plying the globe in their wooden galleons would measure the passage of time by placing a chocolate egg aft of the poop deck, marking off the days by the position of the white mould-line as it crawled its way across the surface of the egg. But this only worked with rubbishy supermarket chocolate eggs that went mouldy easily. 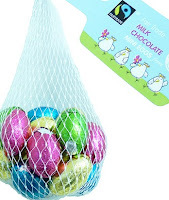 All that changed when the Mustard Seed started stocking their much more delicious and higher quality fairtrade chocolate eggs. So - when Sir Francis Drake bought his lovely fairtrade chocolate egg from the Mustard Seed and it didn't go mouldy; he died of fright as a result - all because he thought his whole family had been turned to stone. (He'd landed on Easter Island by mistake). Ever since then, chocolate eggs have been part of our Easter celebrations, and the very best ones are found in the Mustard Seed - along with a lovely explanation of the Easter Message (no mention of the slaver Francis Drake though - which is a good thing too, because he wasn't a very fair trader at all). The Real Easter Egg is the first and only Fairtrade chocolate Easter Egg to explain the Christian understanding of Easter on the box. As well as being fully fairtrade, it also supports charity and development projects - buying everything from medical equipment for new mums here at home, to chickens and securing fresh water for farmers in Africa. And - because these special eggs are slightly smaller than usual - they also have a lot less air in them compared to the normal rubbishy supermarket ones (what a rip-off eh - charging for air! ) , and are therefore also much less fattening (air contains 586 cal / 100g ) . But maybe these beautiful eggs are still a bit too big for you? 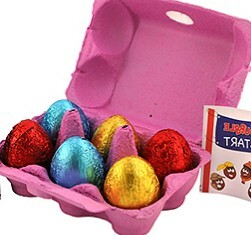 For the egg-poacher turned egg-hunter looking for six of one & half a dozen of the other, we have the new Easter Egg Hunters' Kit from Divine (Ghana) - delivered to you in a real egg box with set of real egg hunter signs and six real chocolate eggs - also suitable for frying, poaching & boiling. Let me know how you get on. Three minutes should do it. Sorry - what was that? You don't want any air at all in your egg? You just want deliciously solid smooth chocolate in the shape of an egg so that it's perfect for secretly sniffing & licking? Well - that is bordering on the Sybaritic. Bacchanalian even. Epicurian some might say. Definitely Ambrosial. OK. We'll make a few especially for you. But to curb your excesses, we're going to have to make your solid eggs delicately petite - so that when you breathe in those heady chocolatey aromas you don't over-indulge. And there it is. The eggsquisitely crafted mini egg. Just for you. A whole bagful. Perfect for licking and perfect for sharing (although - probably not in that order) . Also perfect for hiding from children. But not so good for coddling or pickling. Microwaving is quite fun though, especially with the wrapper still on. 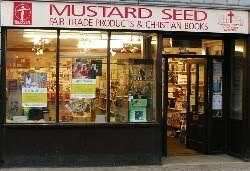 Yoking apart, if you're as eggcited & eggstatic as me about all of this, I suggest you scramble down to the Mustard Seed at once to stock up in plenty of time for Easter; egged on by the Lilliputian big-endians and little-endians alike. He was called "Ein Stein" by his mum because he weighed in at a whopping "One Stone" when born. No wonder he landed on his head. And in the eleventh dimension, Einstein was born (14th March) in the same year as he died (18th April). This being the 1st of April, we're now at the exact balance-point between the two dates. We have Equality. Equality = Mustard Ceed2 . Or E = MC2 . (Funny - if Einstein had been better at spelling then that famous equation would have been E = MS2 I suppose ) . But did you know that - because of the Theory of General Relativity - your head ages faster than your feet? 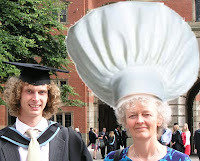 (just look at Albert's head if you're not convinced) . Relative speed of aging all depends on the distance from the nearest significant gravitational field. Yes - a 79 year old head - being six feet further away from the Earth - is approximately 90 billionths of a second older than the attached feet (assuming same owner, no transplants, and no standing on head) . You'll be pleased to know that - in order to optimise product quality - we've now applied the Theory of General Relativity to the placement of items on the Mustard Seed shelves. Clearly - items placed on the higher shelves will age more rapidly. Under the new layout, looking at the top shelf, the coffee aficionados amongst you I'm sure will appreciate the new deep rich overtones in the machu picchu flavours that can only come about because of that added relative time. But rancid cashews & brazils on the other hand are more of an acquired taste. So - not surprisingly, they're now wallowing in the elixir of eternal nuttiness that is represented by that bottom shelf, where time crawls more sluggishly - relatively speaking. But - every silver lining has a cloud could. And what is that could - you may ask? Well - the top shelf items will get old faster and will reach their sell-by dates sooner - and if we're not careful this could create a crack in the very fabric of space-time itself. But you can help prevent this could from happening. How - you may well ask? Well, simply buy more stuff - more often - and more quickly. Here's how it works. Imagine a Geobar racing round inside the Large Hadron Collider - chased by hoards of Higgs-Boson particles (as yet undiscovered) - trying to catch up with its own sell-by date. You then breeze in - sipping your martini. You nonchalantly reach into the bowels of the big machine - ignoring the intense electromagnetic fields that would fry any normal mortal - and you then BUY the Geobar - while discovering the Higgs-Boson at the same time. Result? The Geobar never reaches its sell-by date, and your ethical decision (well - the gluons in your Moral Relativity to be more precise ) neatly glues up the cracks in the anti-matter space-time continuum. You've saved the planet - yet again. But - be careful... (see graph) . Joy-riding the LHC sounds like fun - but going really really fast can cause ethical mayhem. It's probably safer just to chase down to the Mustard Seed (not TOO fast mind) & buy your Geobars there. P.S. Well done on the Higgs-Boson by the way.